Sadichha Shrestha, 19, has become this year’s Miss Nepal. Contestant no. 1 Sadichha was crowned the Darbur Special Hidden Treasure Miss Nepal 2010 during a special program held at Tribhuwan Army Officers Club, Bhadrakali, Kathmandu on Sept. 1, 2010. 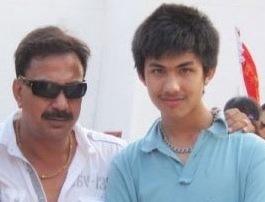 Anamol KC, the star-son, upcoming actor, supposed to walk on his father’s step became popular among the younger generation even before the release of his first movie. Bhuwan KC, the father has something else planned for the cute boy. He wants Anamol to finish studies before he fully plunges into acting. When the parents, Bhuwan and Sushmita started feeling the celebrity status heating up, Anamol’s studies started to get worse. 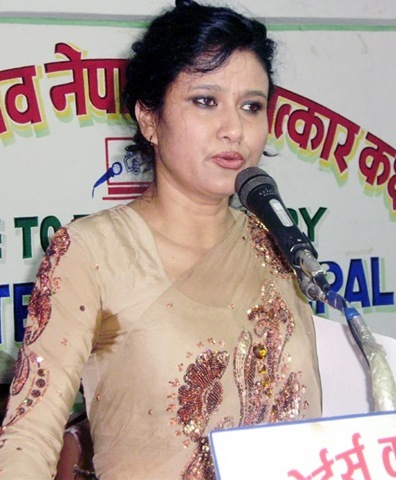 When a promo of her upcoming album was banned from Nepal Television, Komal Oli called a press conference to express her dissatisfaction. While some think the words in song calling Lord Shiva ‘Badmas‘ is not good for religious sentiments. Other think Komal herself is creating issue out of nothing to promote her album. Can't Himani pierce her bellybutton ? When Kantipur published the following photo of Himani, people everywhere were talking about the pierced bellybutton of the former princess. Is monarchy playing Himani Card ? In the time when former prince Paras Shah is trying to mingle with the public and offering interviews to the journalists, his wife has started attending public program. At these programs, all the beautiful former princess does is offer the beautiful smile. 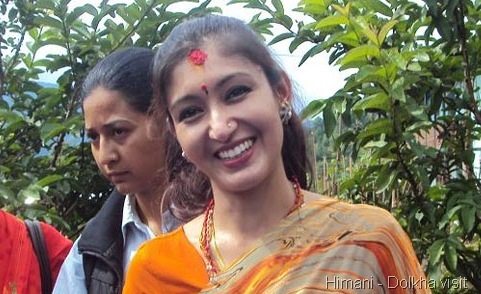 In the photo above, Himani Shah (Right) is smiling to the local people. Her bodyguard Puja Karki can be seen in the background.